When I woke up this morning, I was outraged to discover that $3,050 in Truman State University funds (taken from the non-optional “student activity fee” charged to all Truman students) was taken to hire one of the most prolific Islamophobes alive, Robert Spencer, to give a talk called “Exposed: The Truth About Radical Islam” despite his purported neo-Nazi ties and the fact that he has been banned from the United Kingdom for his radical agenda to defame Islam and spread hate and misinformation. This event is being funded by the University and hosted by the College Republicans and being held April 13th, 8:00pm in Violette Hall, Room 1000. A quick google search of Robert Spencer reveals his “extremist profile” on the Southern Poverty Law Center’s website. They state that “As the director of the Jihad Watch blog and co-founder of Stop Islamization of America, Robert Spencer is one of America’s most prolific and vociferous anti-Muslim propagandists.” Continuing, they explain that Robert “insists, despite his lack of academic training in Islam, that the religion is inherently violent and that radical jihadists who commit acts of terror are simply following its dictates.” His writing was cited dozens of times in a manifesto written by the Norwegian terrorist Anders Breivik. Spencer was banned from the United Kingdom as an extremist in July 2013” (Southern Poverty Law Center). So, despite the fact that the United Kingdom has banned this man from entering their country because his views on Islam are incorrect and hateful, Truman State has not only invited, but is PAYING him to come our campus, using thousands of dollars in University funding. The FAC (Funds Allotment Council) has public records which prove that this funding was in fact, provided to the College Republican club to host this event. Those records can be found here: https://fac.truman.edu/slates/ under Spring 2017. While outraged students have been writing letters to school administration and planning ways to stage nonviolent and peaceful protest at the event, which is scheduled for April 13th, 2017 at 8pm, online threats have recently surfaced advocating for the shooting, lobotomization, imprisonment and expulsion of students who disagree with Spencer or plan to protest. Attached below is an image of one such comment, however, it is just one of many. The rest can be seen on Robert Spencer’s personal website, here: https://www.jihadwatch.org/2017/04/truman-state-university-student-calls-for-violence-ahead-of-robert-spencer-lecture. these comments are also incredibly transphobic. Several Truman students are calling the event “tone-deaf” especially given the ongoing mental health crisis being experienced at Truman’s campus, with our current suicide rate 6.25x that of the national average at other Universities. A Truman student committed suicide just last week and with such a fragile and stressful campus environment at present, the last thing our University needs is additional stressors and events which incite violence, stress, and promote hate. Furthermore, following Trump’s Muslim travel ban, University President Dr. Sue Thomas sent out an email ensuring that minority students would be protected and supported, yet by allowing and funding anti-Islamic speakers like Robert Spencer, they are doing precisely the opposite. Truman claims to promote an atmosphere in which diversity is respected and students of every creed, color, religion and culture can feel protected and safe. But their actions (and lack thereof) demonstrate otherwise. 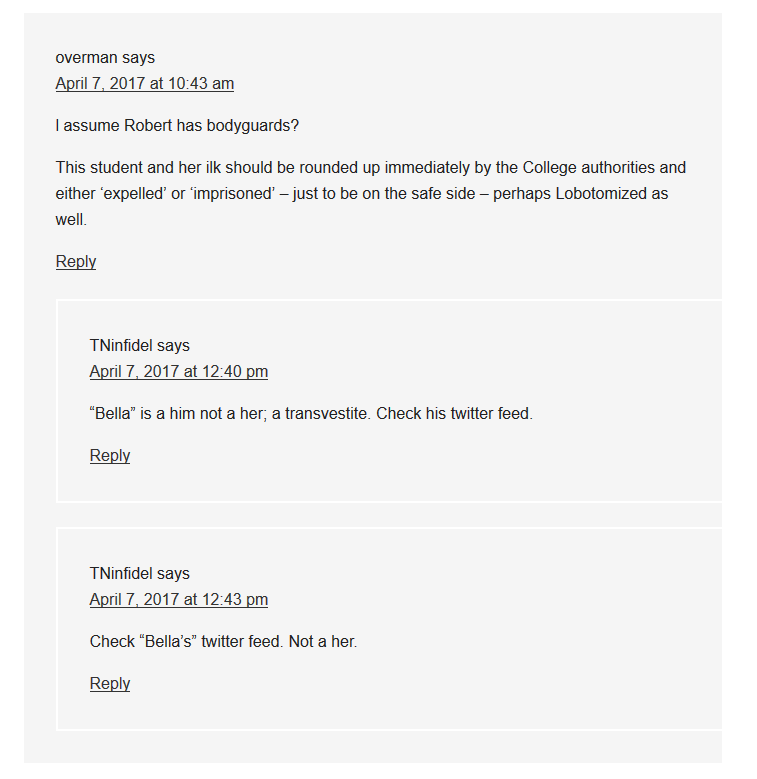 Furthermore, Robert’s rhetoric and platform has been characterized as “hate-speech” in the past which many feel should not fall under the definition of “free speech.” Furthermore, such speech is not appropriate on a campus that has falsely promised to stand up for minority students and help them feel safe and protected. If the event is not canceled despite violent threats towards peaceful protesters and students who disagree with Spencer’s extremist, bigoted stance, there will be nonviolent protests staged by students who are standing in solidarity with our fellow Muslim brothers and sisters. By continuing to host this event, despite an outpouring of outrage from the student body, Truman State is alienating and actively oppressing their Muslim student body. I would urge any Truman alumni to immediately call Truman and ask to be taken off donor lists and any high schoolers considering attending Truman State to keep the actions of the University at this time in mind. Next Post:Sean Spicer: Holocaust denier?